Friday I posted about our first Cataclysm raidkill. I wrote "Wowprogress says 5900 guilds killed Halfus, if we assume 20 raiders/guild and 4M people who bought Cata, we are in the top 3%! (wowprogress has some latency, so it's possible that more guilds did it, but we are surely in top 5%) " Got some pretty strange comments. Some were primitive trollings, but intelligently written ones also claimed that the number is wrong as most of the 4M players are "not raiders" so I should only count with the raiders (there is obviously no way to figure out how many are they). The above logic is just as bad as claiming that the 100m sprint World Champion actually just defeated 7 runners in the other lanes and did not defeat me. While this is technically true, he is still faster than me. Just because I choose to not compete for the 100m gold, it doesn't mean he did not earn his. Like usually, socials are feeling that they are right and they just make up some nonsense rationalization for that feeling. However this case I can find a better rationalization for them: there is no shame in being a non-raider, just like I don't have to be ashamed of not doing any serious athletics since college. However it does not change the fact that they are objectively worse raiders than those who killed bosses, just like as I'm objectively slower not just than the world champion, but than every single serious runner. Two things can be added, one subjective and one really important. The first refers to the question: "why do you take the 4M Cataclysm owners basis and why don't you claim that you are better than 6 billion people who never played WoW". The answer contains the subjective term "fair competition". It means that it's unfair to claim that "I raid better raider than someone in Africa without internet", despite it's objectively true. It's unfair because he may have better skills but has no chance to prove it. The 4M people surely have the basic elements needed to compete for bosskills: active, upgraded WoW account, functional computer with internet, will and time to play WoW. The important thing to add is that the above idea gives a clear and objective distinction between "challenge" and "stupid waste of time". Despite I haven't ran 100m with a will to win for a decade, we can unquestionably say that I would lose against a professional athlete. Good results can only be achieved by regular training, dedication and proper physical fitness. I don't have these so without me ever standing at the starter machine we can be sure that I'd lose. In a challenge every non-player would lose if he would choose to play. I may choose to start training and then have a shot among the senior runners, but I cannot claim - no matter how hard I decide to train - that I will win. On the other hand I can reasonably claim that I could get 75 pets if I cared to. I would buy the buyable ones and farm the rest. No steps of getting the pets have a difficulty that I cannot overcome. I could get it if I wanted to, so the "race for it" is no challenge, it's a stupid waste of time. Surely the measure should be how long it takes you to kill a boss from when your raid first enters the instance? There's no point measuring speed of levelling and gearing up. Because that's not really raid skill. What about the over 4000 Guilds downing Conclave of Wind before Halfus? Another 7000 have downed the Defense Council, and just slightly fewer killed Magmaw. There will be some overlap, but it's probably a lot less than you might think. Most of these guilds probably haven't done any attempts on Halfus. I dont see how you can claim that the 75 pets thing is a supid waste of time, without condeming the whole game as a stupid waste of time. From my experience of raiding, it takes about 12hrs of gearing to get raid ready with a good guild, then about 2 hours of learning the fight (either by watching youtube and tank spot first, then wiping a couple of times to three shot it OR going straight in and just wiping till its done 2hrs later as you muddle through). Thats per boss. So to get 75 pets, I would assume pretty much you have the intial 25-30ish you can get from various vendors, the next 25-30ish you get from ah (some for ridiculous amounts of gold that would take most average players a fair bit of game time to get) the rest through farming sometimes for several hours till you got lucky. So what have you got? I spend 12 weeks, 3hrs 2-3 nights a week I get to call myself Starcaller or Kingslayer. He gets to show off his 75 pets. Its all virtual, in a makebelieve world. All in fact a stupid waste of time too a non wow player who wonders why I wasnt out pulling girls/going to night school to further my real life earning abilites. So how is being top 3% in the world raider "better" then top 3% "quantity of pets owned"? @nightgerbil: A case could be made that getting 75 pets is less of an achievement than, say, clearing a difficult raid because the former can be done by simply spending a lot of time on it, without needing to improve any skills no matter how bad you were initially, while the latter does need some level of skill to be at all possible. If you can't avoid standing in the fire, you need to improve in order to have a shot at becoming a Kingslayer, and I'd hope you need somewhat more sophisticated skills as well. The distinction here is that for pet farming, you don't need to think. You can slog through without ever noticing any of your mistakes, and you'll still end up with the pets you want. It doesn't make raiding any more 'worthy' than having a lot of pets, but it does in my eyes make it more difficult, and hence more 'worthy of admiration' if that is desirable. I rather like this suggestion. Most of the examples you show at the bottom of your post, whilst foolish, I can generally see where they've made their mistake. Today's example entirely baffles me, why insist on being retold the guild level ? Bewildering or have I missed something ? Not you - Palydwarf missed something. People with lower intelligence have lower reading comprehension skills, hence he is actually incapable to just glance at the chat and spot the guild level. To read something, Palydwarf has to do it highly concentrated and one (at best 2 or 3) word at a time. Its counter-intuitive, because everyone naturally expects others to have the same basic skills as he does, but there are people who are actually radically worse than the majority at reading (and more importantly - comprehending). There are also those who can practically flip through a book and comprehend it all, though I can scarcely imagine how its possible. "In a challenge every non-player would lose if he would choose to play. I may choose to start training and then have a shot among the senior runners, but I cannot claim - no matter how hard I decide to train - that I will win." This is might true, but there are several super athletes around (drugs or no drugs doesnt matter), like Michael Phelps in swimming. If he jumps in the pool, he can be 99% sure, that he will win the gold medal. Calling yourself Starcaller also increases your gear (you need some updates and things will drop). Getting 75 pets gets you... ...yep another pet. So by raiding I can improve my gear for PvP of just for standing around and look "awesome" or just make the next content easier. by getting 75 pets I just can stant around and feel "awesome". So you get less benefit and that way it is a waste of time for gevlon as he would never assume that another pet is worth any efford. If you didn´t get that by now and if you want to challenge his opinion about pets and mounts I thing you never really red blog or want to waste your time. @Topic: Actually we are leveling up professions guildinternal, boosting cooking and fishing to an average level. I myself are actually mass producing goblin barbeque for the upcoming raidtime when our winterholyday ends (also I am actually working 50-60 hrs a week on a commerical project). Aw and yes PvP also. So I rank myself in the lower range of pve´ers that have only done every heroic and the tol barad boss. And several fights follow that. It´s not only that you can choose to make it the hard fast way or the easy slow way, there is always some "lucky" case that can boost you or the "unlucky-fuckup" that can extremly slow down the whole encounter. And by that way this is also not really raid skill. 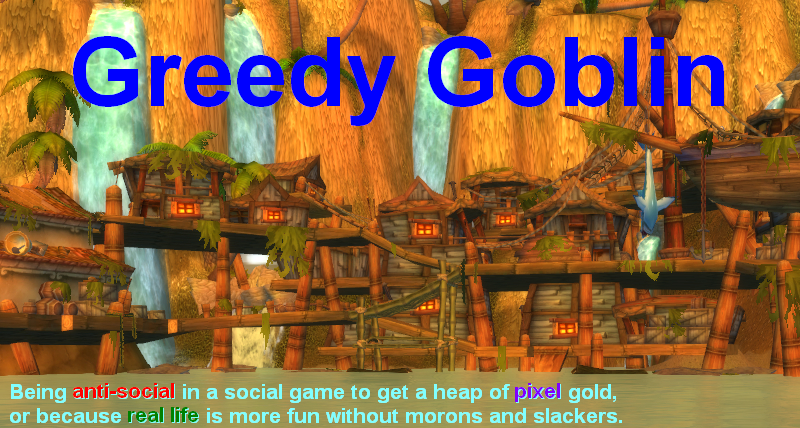 @ Desolate I continue to poke the Goblin, because I dont understand the logic behind his generic sneer for achievments/pets/mounts or why he sees the continuing misson to seek out more pets and boldly go where no nolifers have gone before as evidence of stupidity. Now the anonymous poster made a dam good reply, which kinda blew my argument out of the water. Hats off to you sir. Wheras I have to say the extra pet at 75 pets, would be helpful for the chap going for 100 pets. Dear lord 100 pets. Imagine the grind? the time researching on the net to find out where they dropped? the sheer tenacity involved. On a par with a raiders I believe, even if they dont need the same skill set I do. @Nightgerbil: you don't look like someone who read the post. While pet hunt can take MORE time than raiding, it CANNOT FAIL. If you invest X time, you surely get N pets. If you invest X time, you may get a big repair bill and nothing else in a raid. Raid can fail, success depends on "skill" (whatever it is), while pet hunt just need grinding time. WrathOfTheAlliance... That made my chuckle almost as hard as when the Guild Fairy-Tail was looking for members on the Server I currently play on. @spinksville: I disagree. If the PvE Ranking were made by Entry-Kill Ratios it would just come down to gearing up and Speedruns. Guilds that aim for Rankings would then gradually increase their ranking as the Bosses become a routine and the Players outgear the Instance. I strongly disagree that repeating farming should determine the Top PvE Guilds. Or do you suggest it only to go by firstkill? This would be the Death of most Mods and Strategie Guides as the Top Guilds would, for the sake of Competition, stop releasing their Videos, submit Data to the Bossmod Teams and would most probably stop writing Guids at all. (Or they would just keep reforming their Guilds and do the same Speedruns mentioned above). Time spent preparing for Raids in WoW show the determination of each Player and aside from his individual Skill are a major Factor when it comes to PvE Rankings. The Guild that had 25 Players in 333-346 Gear raiding by Wednesday after release is of to a better start and the Leaders can be sure that they have 25 Players that are determined and willing to push for a high Ranking. @nightgerbil: where no nolifer has gone before... ...did you ever hear of littlegrey (nolifers have challenged everything in WoW so we can skip that stupid pseudostatement)? Well and the challange of "beating the 100petsMegagrind" I solved for you, no more skill needed just grind it up and feel happy. You get why I think that petcollecting is quite useless? As said by raiding I can at least imrove my pvp-equipment. I doubt a noncombatpet will bring fear upon the alliance (well unless it´s anything looking like three other hordes) or vice versa horde (same thing here). I´d consider pet collecting when noncombatpets can make interesting interaction with enemy corpses. I´d love a mini-dukenukem ripping the head off and getting himself a newspaper to do what he did to one of the campainbosses at DukeNukem 3D. I would be very interested in reading what strategy you work out for Halfus when/if you face the combination of Nether Scion, Slate Dragon and Storm Rider, and whether or not you succeed. From what I've heard, this encounter has a highly variable degree of difficulty that is determined entirely by random number generator and the combination you ended up with this week is one that has been described by some beta testers as "the easiest possible". I'm curious if that's true, I think it would be valuable if you compared your experiences in future raids. *If* it turns out to be true, that there are some circumstances where players do not have access to the same encounter that you defeated, there is no way of measuring how many players might be locked out of "competing" and your calculations would be proven skewed, unverifiable. At least until everyone can reasonably be expected to have attempted all variations of the fight. In the essence of gathering pets, mounts, reputation or any other collectible you can think of in wow, does not really make you stupid. Lets draw this from the 3rd person perspective as nightgerbil suggested, a non-wow player might see killing a difficult raid boss and completing the 100 mount achievement as both "useless" and in the same category. To them it is all still just a useless stupid game. Now in terms of doing a raid, it needs skill like timing, orginisation, gear, class setup, strategy per role(tank, dps, heal) and the list goes on. With collecting 100 mounts you have to research where they are, figure out how to get them, then you have to travel there, grind(the part gevlon despises), and also a miriad of other things that need to be done as a human skill to obtain said pets. Now I you don't really care about social "praise" for playing wow, I find it "fun" to complete a challenge as I would call some achievements, I am "playing" wow. In conclusion, I play wow, You play wow, your Kingslayer is no better than my 25 Exhalted reputations, because we are both completing objectives set out for us by Blizzard. Also, if someone doesn't litter Gchat with 1337sp43k, never begs, adds intellectual discussions, is not named arthasdklol and can get out of the fire and yet likes to farm 75 pets, is he an M&S? WoW is a game with many different aspects. Usually the PvE aspect is seen as the most important, and if i understood this right, you think the same. You gave an example that you can't win the olympics, because you know you don't have the right physical state. However, this would means that any WoW player who doesn't raid, automaticly doesn't have enough skills to do so. This is not true, because as i said there are many different aspects of the game. For example, I'm a real PvP hero. I don't really do PvE but i'm a good PvP player. Does that make me an unskilled player? You could say the same for the average PvE hero. He doesn't have high rating, so he isn't skilled. I think you're right in using the 4 million people, but as you wrote it now, it looks like all PvP players don't have skills, because they didn't kill any bosses. @Nish: the randomness of the encounter is Blizzard's work and I can't do anything about it. @Anonymous: the player who don't behave like an idiot, yet he collects pets is a standard grinding social. Six-pack Joe, who works hard, get some low salary and fine with it. PvE as a competition is just like the other sport's competitions: there are rules, rankings, winners and losers. What matters are the results. If you don't partecipate you have no results. You claim you can do better than the others? Claims are not enough anywhere, you have to prove it in the playfield. "In a challenge every non-player would lose if he would choose to play." This reminds me of a thing i noticed in fictional stories, both in movies and books. You often see a protagonist, who is an utter amateur in everything. The only thing he has is a strong moral sense. However, said protagonist is fated to become astoundingly well versed in his skills, once the story needs him to be it. In fantasy novels, he will grab a sword and soon after beat the best opponents, in action movies, he can drive every vehicle, without ever having touched the controlls, and so on. The underlying message of course is "you can do be the best if you want to" and thus dedication and the mere wish to be better becomes a replacement for training and hard earned skills. How does it relate to your topic? The non-reflective social knows that he is the protagonist in his universe, so he obviously has to get everything right, if he only would dedicate himself to it. Alas, he doesnt have the motication to do it. This way he can live forever in the illusion of being theoretically able to master everything and the realization, that skill is something that is hard to earn, will never come to him. Achievements are only useful as they improve the self. In WoW, the only achievements worth anything at all or those that are given for improved gameplay (i.e. 2200, heroic raid). Pets do not do this. Pets achievements are recognition of time allotment decisions, not skill improvement. Socials can be delusional but typically in sports do realize their limits are well below the champions they are fan of or they watch on TV. What they don't understand is that the same applies in any field (videogames included) no matter if they consider it "sport" or not. Here in example it's becoming somewhat more and more "trendy" to play poker. There are countless clueless who think professional poker is not "sport" and think you don't need talent, skill, training, dedication to succeed at high level. They basically get owned non-stop by professional players and don't realize they are such crappy players because the world is full of amateurs. Thankfully the most serious tournament have a high entrance barrier (a nice and steep admission fee). For me being in the top 3-5% for dowing the second boss of a raid isn't much different then say going for a realm first while lvling. These encounters whilst I haven't done them are still early raiding which almost all decent raiding guilds will down. It might take till valor gear becomes justice gear but eventually arthasdklol will complete it too after wiping 100 times. For me all this says is I can find 10 players in my guild that can down 2/4 BoT normal before nerfs and overgearing. My whole point is saying that the speed at which you have gone through 2/4 that you claim puts you in the top 3-5% doesn't matter because this isn't "hard" raiding. For me the biggest turn away from the PuG is that you have only gone 8/12 in HM 10man ICC and downed 10man Halion. I've downed 25man Halion went 6/12 HM 10man icc while in a Friendly helpful social guild from pugging with random people. The only reason i didn't go farther was I couldn't show up the next night for more HM icc. What would have amazed me was if you had wrote we cleared BoT and will be starting heroic next week. Downing the early bosses in a dungeon Isn't that hard. I would rate soloing those dungeons you use to do as a greater difficulty then this simply because of crushing blows. You cite the following requirements to be able to compete: active, upgraded WoW account, functional computer with internet, will and time to play WoW. plus "skill" which is what separates the 3.95M players who are not in the top % of raiders. The key issue I would take is that "time to play WoW" differs from "time to raid" - but the skill may still exist in many cases. I know many people who I played with years ago that I would consider skilled raiders who are not currently raiding. I have completed most raids (starting with MC and BWL 40-mans) but as 6 years have passed, my time commitment has become tighter. I have not even hit 85, let alone killed a raid boss in Cataclysm. This does not mean I am not as skilled a player as you or anyone who has killed a raid boss. I would generally consider myself a strong player, probably somewhere in the middle of raid healers as far as skill is concerned. Sorry, but I think your logic there doesn't make much sense. Competition is only meaningful among the competitors and comparing yourself to those who aren't even participating only gives off the impression that you're trying to look better than you are. It's like an Olympic runner coming last in the race and then going around saying how proud he is that he beat all the spectators. After all they have two legs too and could try to become professionals if they only wanted to, right? It's not untrue, just completely irrelevant. He ran the race to compete with the other runners, not to assert his superiority over the spectators. The difference between collecting pets/mounts and raiding is that you depend only of your own time investment/dedication. Another thing is that a generic moron will never have enough skill to organize himself to pay (get the gold in the first place) for something like LK heroic mount (while it was still possible). In raids however, your group is as skillful as the least skillful member (or skill synergy of several least skillful members) of your group, unless you dramatically overgear the content. You can be the best tank or healer in the world but you still won't be able to carry several fire-standing DPS. A real analogue for collecting would be something like postmark/stamp/coin collecting. It's just specific hobby that takes just time and money, and skill to find some very rare exemplars. Real life "PvE" can be something like navigating around the world with few of your friends with wind-only yact, hunting some big fish or animal. It also takes time, money and skill. Both of these activities take different kinds of skillset/dedication. That does not mean that either type of activities is somehow objectively better than the other. Another note about "WoW pets" is that it does not end at "75" pets. Some of the collectors do things like going to Blizzcon's etc. to get otherwise unobtainable pet. It would be interesting, if we could obtain the % of playerbase that have maximum amount of pets currently obtainable in game. I can't find it on any WoW datamining sites. Simply because there is no 'World first get X pets' competition does not mean that getting them in most optimal way is somehow an easy task and just a grind. That being said, anyone, who bothers and is not a total idiot with 20 APM, can just pay like $100k (real life money) for a raid spot in a top-guild and be in top 0.5% statistically for several patches. Not the first-kills, but 2nd/3rd reset kills for sure. Possibly even first kills later, when he gets to grind all the general raid mechanic type overcoming skills in top-notch environment. An additional problem that you left out is that there are a fair number of people that are empirically good at raiding, based on their prior accomplishments, but either choose to no longer raid or can't raid in a serious fashion due to real life reasons. Until April, I ran with a top 100 guild, then quit for personal reasons. I posted multiple parses that were in the top 10 in the world for Demo Warlocks, and did them during US top 50-100 kills. Am I now empirically bad at raiding? I'd say not, but I'm sure there's plenty of people in the same boat. It'd be silly for me to sit here and claim "lol i coulda killed halfus faster than joo i just didnt want to". I have no evidence for that claim, and individual player skill doesn't even correlate that well to their raid progression anyway. I've seen some pretty excellent players in mediocre guilds - most mediocre guilds aren't held down by their top players, they're held down by the fact that half of their raid is composed of unabashed M&S looking for a boost. In short, I don't buy any argument that attempts to use raiding accomplishments to quantify individual player skill. People choose to not raid that have already shown that they're good at it, and that's just one example of a confounding factor. To say that is a top 3% guild , on the other hand, seems entirely appropriate. what if one doesnt do boxing but has 20years fighting experience, do you think he would likely lose vs the mediocre boxer in boxing? Gevlon, the flaw in your argument is that you place yourself in the top 5% of players of WoW GENERICALLY based on a particular activity which you claim is superior to all others in reflecting skill. There are just too many other variables you are ignoring. 1. Not everyone playing WoW wants, can, or plans to raid. 2. Cataclysm was released during the Holidays when structured raids are going to be less common. Perhaps your PuG=designed guild has shown some superiority in this aspect. 3. The game is DESIGNED to be played slowly, over a long period of time. 4. The game is DESIGNED to appeal to a broad range of interests. You have essentially gone to a County Fair, entered a contest for which you have trained hard for; then declared yourself better than most everyone else at the fair based on the results of the contest which most didn't even enter. Now you're arguing with us that your contest clearly demonstrates more skill than say a pie-eating contest, and since they didn't enter your contest of skill, it further proves your superiority. besides you cant objectively say that you are better then all wow players at raiding, i haven't even set foot in baradin hold - my main has light of dawn and an alone in the darkness not gained in the zerged 3.3.
your analogy is incorrect(or misleading to be exact) the current world champion is not comparable to your situation. but from that to go to always true is false. and a side note you can say that just because you can buy an achievement its meaningless anything in this game is as meaning less as everything else. for most people dropping 40k for one of the new pets is impossible, that you regard it as idiocy but possible does not mean (both) is not true for them. I find your ideas to be perplexing. You constantly rail against the idiotic socials that are rampant in society and WoW, but you yourself also do pointless things. Remember back when you were running dungeons solo as a low level character? What was the point of that? There was no competition there, and no benefit for completing the dungeon aside from bragging rights. Why bother? It's the same with collecting pets, mounts, tabards, achievements points, and with raiding. Top 5% really doesn't mean that much because it's still thousands of players. You say that given enough time, someone will be able to collect as many pets as possible. I agree. I would also say that given enough time, someone can become a competent raider, as long as they spent that time getting the right gear, learning the encounters, learning their class, and devoting themselves to becoming a better raider. Of course idiotic socials won't become top raiders; they don't even put an ounce of effort into it. But you're making a mistake by saying that one thing requires time, and the other skill. This is a video game. Blizzard would never make things so difficult that people couldn't do them. In fact, you can look through all of the past WoW patches and see a history of them making things easier to ensure that plenty of players have access to them. If we're talking about meaningless things versus useful things, why are you even wasting your time on WoW? Why do you write free blog posts? Many bloggers out there write guides and sell them, or create premium services to get dedicated readers to pay to read new posts. That would be a more goblin thing to do than brag about being one of thousands and thousands that killed a boss. Saying that the 3% figure is inaccurate is similar to saying "i dont go to the vote, but since i could do it, the voter participation percentage is meaningless". If you dont vote, you are no voter (in fact you are just a lazy fool). And if you dont raid, you are no raider. The 3% is absolutely meaningfull. Your example is completely wrong. Olympics is the highest level of competition an athlete can hope to compete in. Being last in one such occasion could well be reason of pride just because being there is not something the regular athlete can achieve. If you manage to compete at that level you can rightfully claim to be among the best, no matter the end result. You still managed to be selected among the best of your country. @ riptor: nope I am raiding in cata as well, downing bosses, wiping to bosses and generally having fun. Always found my fun in raiding, grinds are something to keep me amused while I am on the sub bench. @ desolace yep I got your point and the very first anons, which is what my second post said on the matter. @ Gevlon Yep I did read your post and others previous to this I agree that things that just take time dont hold the same weight as things that require skill. That said while pets was a bad point to pick, what are your thoughts about the people who actively chase achievments like for example deaths demise? The ones that require alot of skill and can be used as a reference to your skill levels in the event you applied to a top raid guild? I'm not following your logic. Someone who isn't raiding, doesn't inheritable raid worse than you if they start (even on their first try). People may not raid for time issues, personal issues (new kid = no time), professional issues (joined a job, wants to make good impression). The expansion is out for a couple of weeks, and they are holiday weeks, surely people can find better things to do. It's very possible that good raiders from WoTLK and before, simply had things come up in this time period and haven't done any raids yet. However your point on athletes is valid. Someone who plays computer games for hours per day, will have no chance in a 100m run against professionals. Yet the leap from competing with professional athletes to killing raid bosses, is an odd one. It reminds me how someone compared players from top wow guilds to Kasparov recently on mmo-champion ... that was just as ridiculous. I don't think people see the difference between "collecting pets" and "complete the raid" which Gevlon is pointing out. Collecting pets only means that you need a skill called "reading", then you spend X amount of time, and you will eventually manage. Artheslulzdk will never manage to reach 2400 rating in the arena, because he's just too bad, doesn't matter how much he plays, he'll always feel that the other classes, players or so have advantages over him. The only advantage pet has over him, is the droprate, which is bound to "lose" at some point. I'm always confused by the rush to get content completed as fast as possible. As if killing a boss before another player proves that you're somehow the better raider. It seems particularly odd this expansion, with the largest change in the 1-60 content, to ignore it all and dive headlong into the endgame content we'll be grinding for the next year and a half anyway. I'm one of the top 5 healers in my faction. I'm also only level 81. Hundreds of other healers on my server have beaten me to the edge of progression. Who cares? In a few weeks, when I get to there, I'll still be one of the top 5 healers. What's the virtue in getting there first, over simply being able to play with excellence? I also don't understand your separation of game content into worthwhile vs waste of time. Almost anyone can eventually get all the pets, but many choose not to. Of course there are players who are horrible at raiding, but I'm not one of them, nor are any of the people I regularly play with. Why would the skill level of horrible people, whom I never bother dealing with, determine whether something is worthwhile? I pick out game tasks to do based on how much I hope to enjoy them. I greatly enjoy seeing all the quest content. I've spent hours and hours the past few weeks on archaeology, because I find it a blast. I love exploring the world and seeing how it's all changed from the original 1-60 experience. I've gone through it 4 times now, a new horde and alliance avatar for each continent. After the first, I decided not to use heirlooms on the rest, since the xp bonus levels you out of the content too quickly, and then you miss out on the overall experience. It's a bit slower, but it's more enjoyable for me. It seems peculiar to dismiss aspects of the game I enjoy, saying 'Oh, but an idiot could do that too!' I ask again, so what? I'm not an idiot, nor do I care about what idiots can or cannot do. I care about what I do, the way I choose to play and the enjoyment I gain from playing. Gevlon, you failed to address a core portion of my comment. I'm not saying that you haven't earned your medal or raiding achievements, relative to the 3.9M people who weren't in the race. What I'm saying is that it's not a suitable measure of success in WoW, especially when you consider that other players may have different objectives. You see, I gave you three examples of people who don't raid, only one of whom you addressed. 1) The pet collector. Grind vs skill - the question is, perhaps, is a marathon runner who comes last better than those who didn't compete? Providing you finish the race at all, this is still a measure of endurance and persistence. 2) The Gladiator PvPer. Is the gold medalist in the 100m sprint a better athlete than the gold medalist in the shotput? It's not comparable. Again, it's the issue about measurement of 'progress'. Wowprogress uses raid kills as a measure of progress. However, it's not the be-all and end-all of progression. PvP progression is a valid means of assessment. 3) The casual gamer. Like you in real life, they don't have time to train for competition. However, you missed the corollary of your statement. You say that you cannot claim that with training, you could beat the senior runners. The corollary of that is that the senior runners cannot claim that if you trained, they could still beat you anyway. The same argument applies to WoW and your guild. Just having an active WoW account does not mean that they have the will and time to compete (i.e. raid) in WoW. You talk about 'fair competition' - if you, in real life, are not fair competition against serious 100m sprinters, then the casual gamer who does not attempt raids is not fair competition against raiders. Again - the measure of performance should be against people who attempt raids. If Wowprogress doesn't track that, then that's a flaw in their data collection that you need to overcome before making your claims. Irrespective of what a person ranks at the Olympics, you or I would not be fair competition against them. The people spending their time levelling new Worgen and Goblins are, likewise, not fair competition against raiders. Extra note - even if you wanted to broaden the fair competition, it would have to be limited by the number of characters at 85. By definition, people under L85 cannot raid, and so, should be excluded in the same way that people without Cataclysm or WoW generally should be excluded. As an example, that would exclude my account, as I haven't had the time to finish levelling to 85 as of yet. But my lack of play time doesn't suggest anything about how skilled a raider I am. Debating which is better, 75 pet achievement, or raid achievements, is debating who has bigger e-peen. And the achievement systems only further instigates more of these meaningless arguments.